This Love Mandala magick spell is not a normal love spell; It’s a spell to help you prepare for True Love and establish an energetic bond between you and your unknown future Soul Mate lover, rather than trying to bind a known lover to you. It also allows you to call on the help of your spirit guides for subtle intuitive guidance about the characteristics to be looking out for. Before you begin, make sure that you have a couple of hours to yourself when you won’t be disturbed. Light some incense and play soft music if you think this will help you relax and be creative. 1. Pull three cards from the Tarot deck of your choice to check the potential of your Mandala spell. The central card gives you a the main area of impact for the Mandala. In this case it’s The Magician (Mercury), so communication is likely to be affected positively. The flanking cards confirm this. The 8 of Wands (Mercury in Sagittarius) promises speed and the 6 of Swords (Mercury in Aquarius) improved problem solving ability. 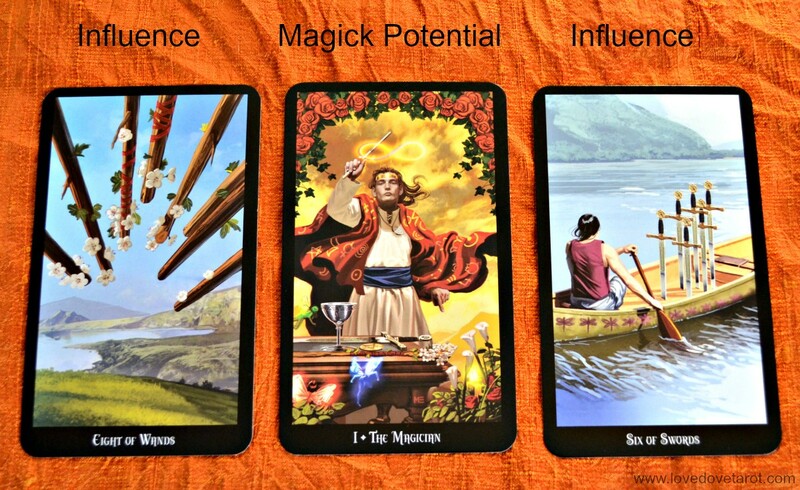 Use the Tarot Card Meanings Index to help with interpretation if you are a Tarot Novice! If the cards are negative or you get a bad vibe from the reading, do not proceed with the working at this point in time. 2. Light the candle and ask for the blessing of your power animal, spirit guides, angels and ancestors. Ask for any bloodline karma to be banished from impacting future relationships and ask your departed love ones to assist you in uniting with the One who will be your True Love. Thank your spirit guides and ancestors for revealing any character traits that are important and that you should be looking out for. 3. Pull a card from the Animal Oracle of your choice. Mediate for a while on the animal spirit guide that appears. Something of the character of your future lover will be revealed this way. This card could even represent his totem animal. 4. Search online for a mandala to print or, if you are feeling extra creative, make your own. 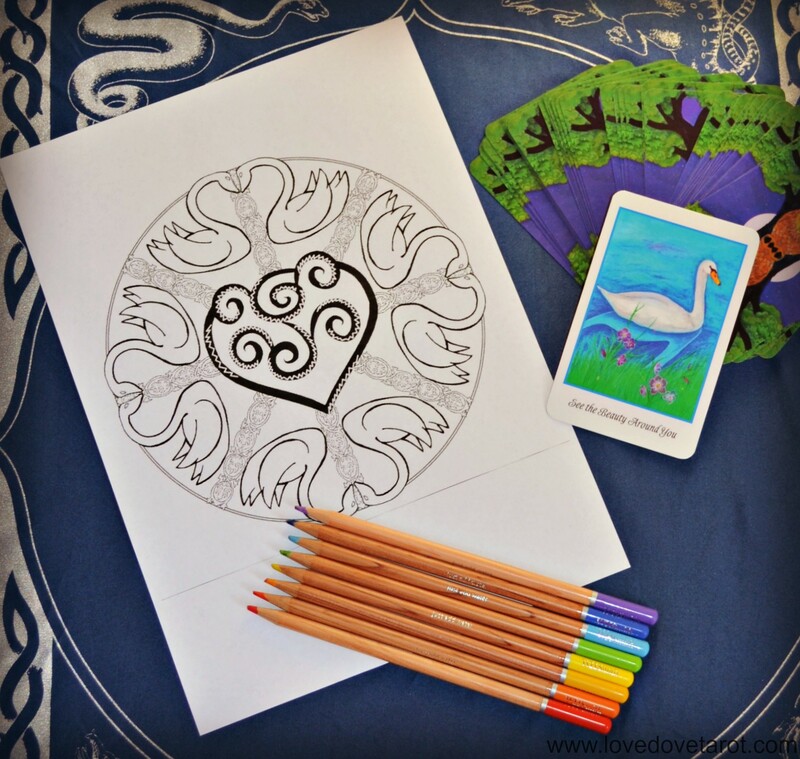 In the image below, you will see a mandala that corresponds nicely with the Swan card from the Higher Intuitions Oracle. I found it googling ‘Swan Mandala.’ If you cannot find a mandala that is an exact fit, read up on the Spirit Animal’s qualities and choose a few keywords to use in the search. Complete the working by giving thanks to Spirit, the Animal Guide and your ancestors. Know that you have now established an energetic bond with your Beloved that will make it easier for him to find you. Pay particular attention any time your Animal Guide shows up in nature, dreams or media!